Today we made I'm Thankful Sunflowers! They turned out great! We used brown construction paper for the center and yellow construction paper for the petals. I then used a hole punch to punch out the center of the brown paper I used for the center. Then a hole at the end of each petal. 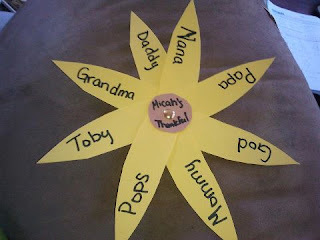 I used a metal brad to put it all together and wrote on each petal something we was thankful for.